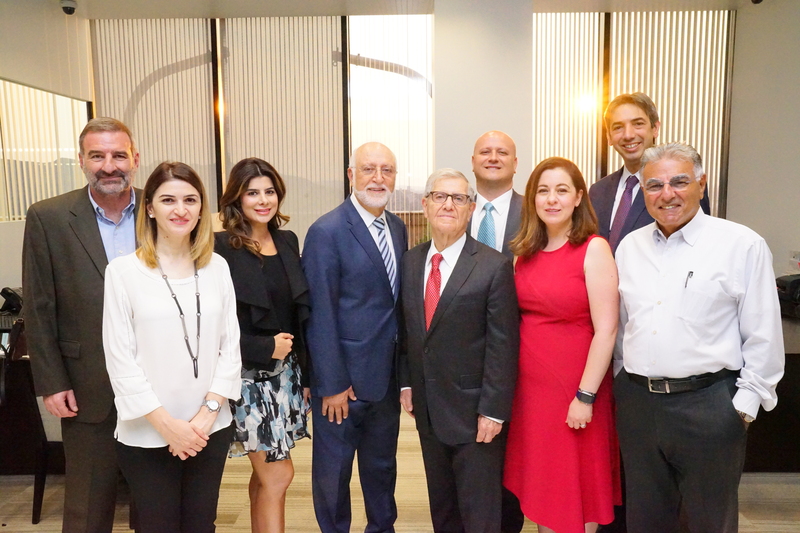 GLENDALE, U.S. ‒ The American University of Armenia (AUA) and the Armenian Bar Association (ArmenBar) joined forces to sponsor a new Technology and Innovation Legal Clinic at AUA’s campus in Yerevan through two receptions in California, led by David Balabanian, Esq. The Golden State Bank in Glendale hosted the Los Angeles metro area gathering and the law offices of Morgan, Lewis & Bockius, LLP in San Francisco, with Balabanian as host, served as the engaging settings for legal professionals, AUA leadership and supporters who came together to learn more about the ArmenBars partnership with Armenia’s leading university and its innovative projects for current and future students. Balabanian, the first chairman of the ArmenBar, welcomed guests and highlighted the significance of raising dialogue about the role of legal education in Armenia by creating stronger ties between the Diaspora and the homeland. Through his work with the ArmenBar, Balabanian has brought continued awareness to critical legal issues in Armenia, which is now at a crossroads thanks to the Velvet Revolution and a newfound respect for the law. Launching in the Fall of 2018, the Technology and Innovation Legal Clinic, whose operating costs will be sponsored by the ArmenBar, will be made available to the student community through AUA’s Master of Laws (LL.M.) program. 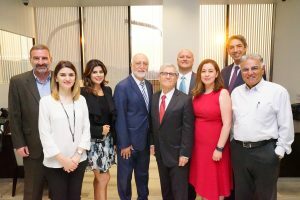 The clinic, which Balabanian noted as a “valuable resource,” will be the first in Armenia to address the needs for professional legal counseling in rapidly growing fields, including technology, which is experiencing a 20% growth in Armenia. Selected AUA students will gain hands-on experience working and providing counseling to IT and engineering startups in relation to a wide range of legal issues, from company registration to contracting to intellectual property rights protection. The legal clinic is one of the many projects Balabanian has spearheaded for the legal community over the years. 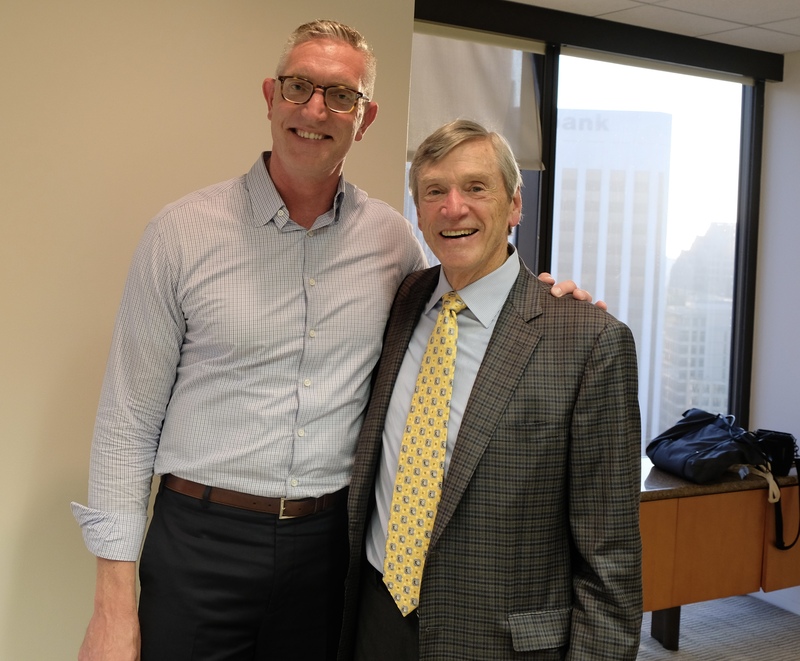 In addition to his impactful work with the ArmenBar, he has served as chairman of the California State Bar Conference of Delegates, lawyer delegate to the Ninth Circuit Judicial Conference, trustee of the Practising Law Institute, and a member of the Harvard Law School Visiting Committee. As an instructor, he has taught more than 150 continuing legal education courses and written extensively on law-related topics. During his remarks, AUA President Dr. Armen Der Kiureghian shared with attendees important updates about the University, including the recently signed bill that provides free law school tuition to the University of California, Hastings College of the Law for AUA graduates who are residents of California. “The signing of this bill by Senator Anthony Portantino shows the confidence that the state of California and UC Hastings have in the American University of Armenia,” said Dr. Der Kiureghian. President Der Kiureghian noted that the student body and faculty were involved in the Velvet Revolution, choosing to exercise their civic duty and rights. 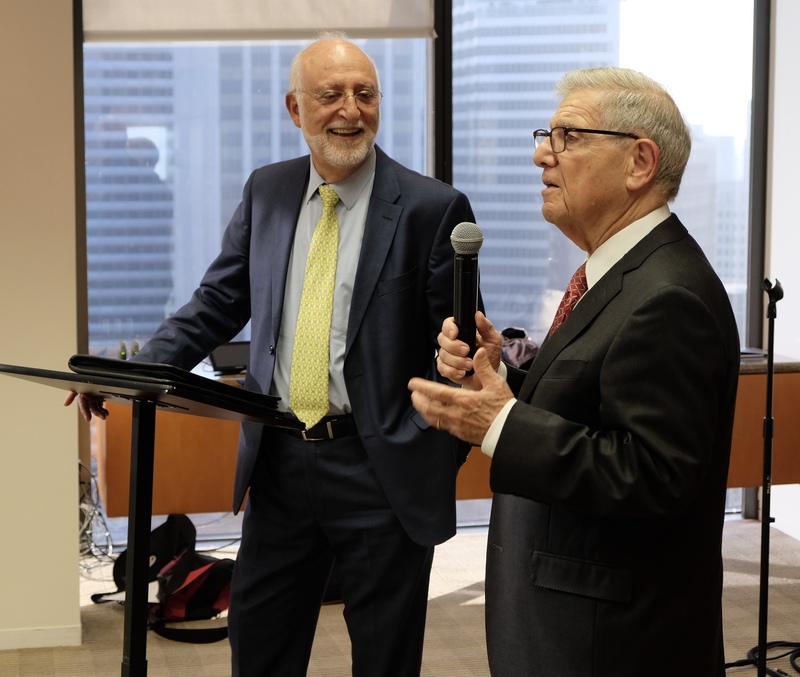 He spoke of the work of AUA’s Entrepreneurship and Product Innovation Center (EPIC), which will work in tandem with the Technology and Innovation Legal Clinic, as well as AUA’s partnerships with USAID and plans to start an AUA press. 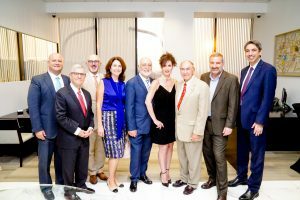 As the director of one of the most creative and effective centers at AUA, EPIC, Dr. Michael Kouchakdjian elaborated on the activities of the ecosystem, which provides AUA’s emerging entrepreneurs with a collaborative space consisting of programs, events and a network of mentors, advisors and investors. In relation to its partnership with the Technology and Innovation Legal Clinic, workshops and seminars will be organized for EPIC and other IT and engineering enterprises and teams. In addition, thanks to the ArmenBar’s sponsorship, top quality legal professionals will supervise the activities of the LL.M. program students in order to ensure consistency and quality of service. Touching on the synergy between the Center and AUA, Dr. Kouchakdjian said that through EPIC, the community at large can engage in the startup venture ecosystem, which is becoming increasingly popular in Armenia. 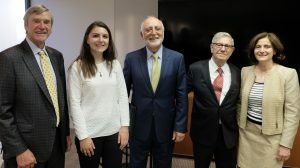 Dr. Lawrence Pitts, Chair of the Board of Trustees and former Provost of the University of California system, said AUA has become a transformative university in Armenia and through the support of benefactors, it can become the best in the region. 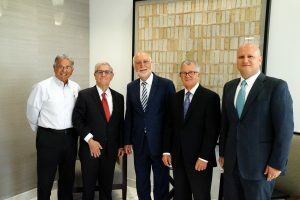 Gerard Kassabian, Esq., David Balabanian, Esq., Hon. Zaven Sinanian, Nelly Der Kiureghian, Dr. Armen Der Kiureghian, Lara Kayayan, Esq., Hon. Robert Philibosian, Dr. Michael Kouchakdjian and Saro Kerkonian, Esq. 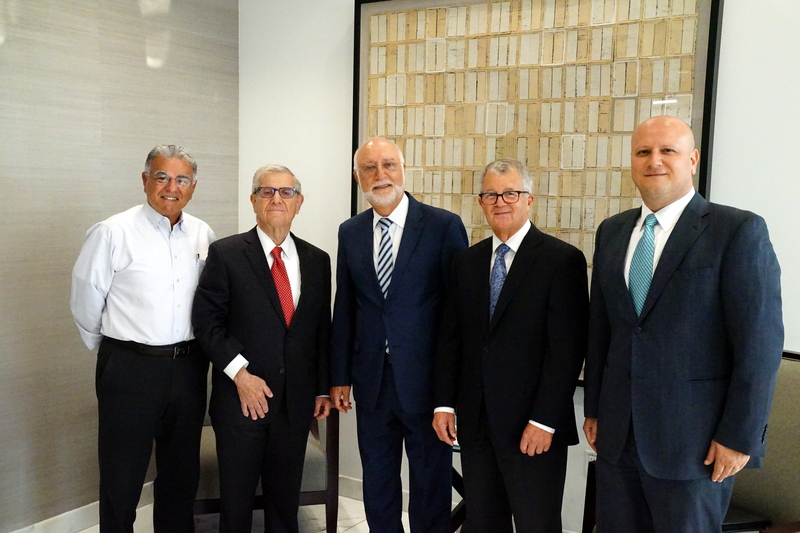 Zaven Akian, David Balabanian, Esq., Dr. Armen Der Kiureghian, Tom Byington and Gerard Kassabian, Esq.